The 49 class were originally purchased to dieselise the (then) uneconomical line to Broken Hill. Initially, the entire class would be based at Parkes, although their duties would take them all over Western NSW, hauling anything from a block wheat train, to a pickup goods, and even the Central West Express on occasion. Originally, six 875hp units were ordered from Clyde Engineering, with a Co-Co wheel arrangement – giving them an axle load of 12.5 tons. These units were very similar to the T Class purchased by the Victorian Railways, having entered service four years prior. A further twelve units would be ordered, in two batches of six units each. The class leader, 4901 would enter service on the 15th of September, 1960, with 4906 entering service on the 9th of March, 1961. It did not take long for the class to prove themselves as reliable (if a little loud) workhorses, and so another six locomotives were ordered in September 1961. 4907 was the first unit of the second batch, entering service midway through 1962, with 4912 (the last unit of the second order) entering service before the end of the year. This second batch of 49 class was surplus to those required for Broken Hill line duties, and when not required at Parkes, they would often be seen working to Dubbo, Forbes and Orange. A final order of six units was placed in August 1963, with 4913 entering service midway through the following year, with the remaining members of the class into service by August 1964. The completion of the standard gauge line through to Adelaide and Perth in 1970 saw the 49 class displaced from the line that they had been originally purchased for. As a result, the class would see service all across country NSW, working as far south as Cootamundra and Junee, west to Cobar and Bourke, and north to Armidale and Moree. In 1989, the railways decided to centralise the maintenance of the entire G.M. fleet in Sydney, resulting in the entire class relocating to DELEC. While in Sydney, the class would see plenty of use on metropolitan goods trains and shunting trips, as well as excursions to Emu Plains (to the Emu Plains gravel siding), Tahmoor (Tahmoor Colliery trains from Rozelle), and even as far south as Bomaderry! To assist with the regauging of the Adelaide to Melbourne mainline from broad to standard gauge, 4903, 4910 and 4912were loaned to National Rail in November 1994 for use on ballast trains in Victoria. All four units would be returned from these duties by mid 1995. The first of the class to be withdrawn would be 4915, in 1989. Stripped of all useful parts, 4915 was cut up for scrap at Cardiff Workshops, near Newcastle. The remaining 17 class members would be withdrawn from service in 1995. The bumper wheat harvest of 1996/7 saw the majority of the class reactivated (all remaining members except 4902) and returned to service, albeit only on metropolitan workings. 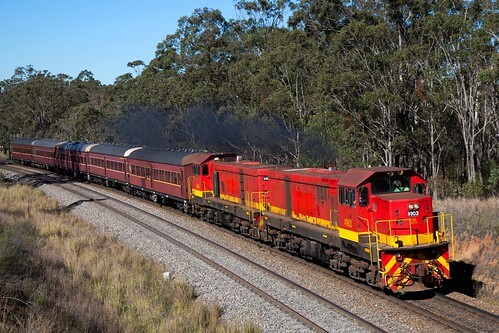 This released a number of mk3 and 4 48 class units for use on wheat trains in rural NSW. The reprieve for the 49 class was short lived, as all remaining class members were placed back into storage by July 1997. The end of their government service did little to diminish the class, with many of the 49 class remaining in operation today in the hands of private operators. Indeed, it is unusual that such a small class has seen so many different uses since leaving government service. 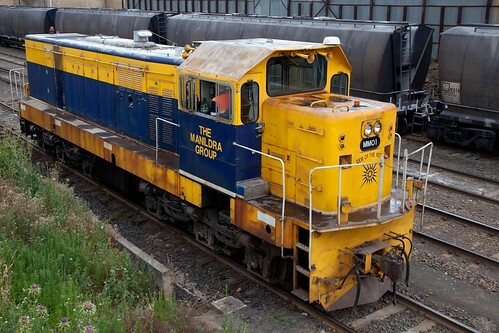 Some members of the class are used as shunters for Manildra Group, while others have entered lease service with CFCL Australia. Still other class members were used for trip train service in Sydney. During July 1994, The Manildra Group trialled 4907 to shunt their flour mill at Gunnedah. As a result, the company decided to purchase 4907, as well as sister unit 4913 to shunt their flour mills at Manildra and Gunnedah respectively. Both units were overhauled by Clyde Engineering at their Kelso (Bathurst) workshops, emerging as MM01 (4907) and MM02 (4913). The most striking change to the locomotives (aside from their distinctive blue and yellow colour scheme) was the lowering of the short hood, and the fitting of a single large windscreen to improve visibility. The Manildra Group also purchased 4906 and 4911, although they did not enter service with the company – 4911 remains at Kelso today, although 4906 did eventually re-enter service with Patrick PortLink (see below). Casino based Northern Rivers Railroad (NRR) hired 4910 from Freightcorp during 1998 for use on local freight trains around the Casino area. In 2001, NRR would purchase a number of 49 class from FreightCorp: 4901, 4902, 4903, 4905, 4906 (from The Manildra Group) 4909, 4912 and 4914. When NRR was taken over by Queensland Rail (QR) to form Interail, the bogies from these 49 class would be used as part of the regauging of six former 1502 class to standard gauge (re numbered as the 423 class). 4903 retained its bogies and was used as a shunter at Casino initially, before being placed into storage. Interail sold 4902 and 4905 (without bogies) to Traction Engineering (Seymour, Victoria) in 2004. 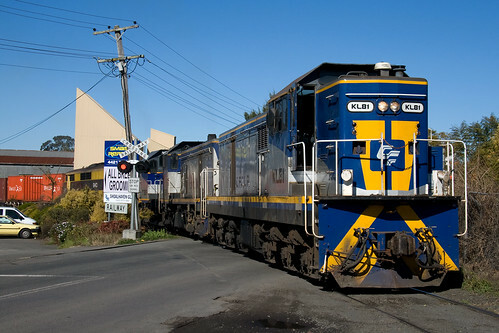 Patrick PortLink would purchase 4903 and 4906 from Interail in 2005, with the two units sent to the State Mine Museum at Lithgow for overhaul, re-entering service before the end of the year. As part of the overhaul, the short hoods on 4903 and 4906 were both lowered, similar to the modifications performed to MM01 and MM02 a decade prior. Additionally, the two 49 class were painted in a bright red and yellow “Patrick” scheme, to represent their new owner. 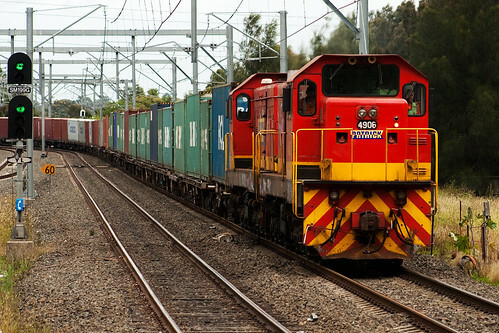 Initially the two units would work container trains out of Narrabri, in north-west NSW, although they would also see service in the Dubbo/Narromine area, as well as around Newcastle. 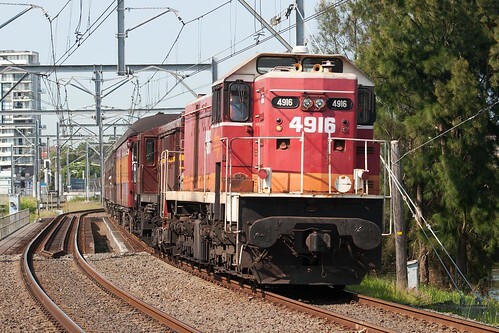 Eventually 4903 and 4906 would return to Sydney, to be used on container trip trains between Sandown and Port Botany – always running as a pair, except when one unit was in Lithgow for maintenance. Chicago Freight Car Leasing Australia (CFCLA) would purchase three 49 class units in 2001 – 4904, 4910 and 4917. Initially, 4904 entered short term service with Austrac, before a brief overhaul and repaint, emerging as KL80. 4910 was similarly painted, entering service as KL81. 4917 required more substantial work prior to re-entering service, finally returning to service as KL82 in 2003. All three units maintain their original short hood configuration, and this seems unlikely to change in the future. Coote Industrial would purchase 4908 from 3801ltd (see below) in 2008 for their Greentrains division. 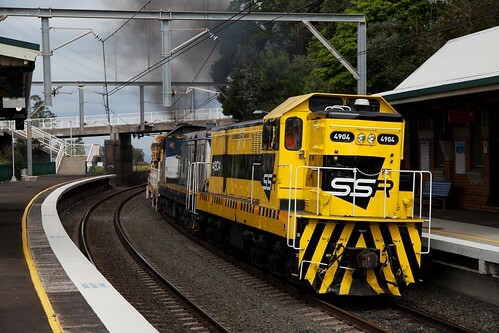 4908 would see service on infrastructure and works trains for South Spur Rail Services (at the time, a division of Coote Industrial), although it would also spend some time in maintenance at RTS, Dynon (Vic). Regardless of the future of those locomotives in private ownership, two members of the class remain in preservation today, one with the New South Wales Rail Transport Museum (NSWRTM) as part of the NSW Core Heritage Fleet, and one with 3801ltd for use on their Cockatoo Run tourist train, as well as being available to work RailCorp infrastructure trains and other similar passenger services. In December 1998, FreightCorp would donate 4916 under “deed of loan” to the NSWRTM for preservation. 4916 entered preservation wearing the NSW State Rail Authority “Candy” livery, and today remains one of only a handful of heritage diesels wearing this scheme. During it’s time in preservation, 4916 has worked further than it ever did in service on various heritage specials – including at least one trip to Melbourne with the Southern Aurora carriage set. In a similar move, 4908 and 4918 were transferred into the custody of 3801ltd from 1999. When FreightCorp was sold to Toll and Patrick to form Pacific National, they were required by the ACCC to sell off a number of locomotives. 3801ltd took this opportunity to purchase 4908 and 4918 outright, for use on their Cockatoo Run tourist train. 4908 would later be sold to Coote Industrial’s Greentrains division, while 4918 remains in heritage service. 4918 is kept busy, even in retirement, often seen leading the Cockatoo Run tourist train solo, or assisting with RailCorp infrastructure train working, often in the company of Goodwin Alco owned 4501 and 4833, or Lachlan Alco owned 4473 or 4486. Towards the end of their service for Patrick PortLink, 4903 and 4906 became increasingly unreliable, finally being pushed aside on May 5th, 2010 at Botany. In their last weeks of service, the two units combined could only haul the same load as a single 48 class. The service they were employed on between Sandown and Botany would cease to operate only ten days later, with all of Patricks rail services ending by the end of June, 2010. The two locomotives would languish in storage at Port Botany until June, 2011 when they were purchased by Lachlan Valley Railway, and transferred to Lithgow for restoration work. Following initial remedial mechanical and cosmetic work (the latter relating to the painting over of the Patrick logos, and graffiti), the two 49 Class were then pressed into service to operate a charter service to Moree over the last weekend of June 2011, for the centenary of the Garah Picnic Races. 4901 – Bogies used for the Interail 423 Class gauge conversion project. Scrapped at Casino in 2008. 4902 – Bogies used for the Interail 423 Class gauge conversion project. Stored on transfer bogies at SRHC, Seymour (Vic). 4903 – LVR, Operational. Patrick Red livery (minus logos). 4904 (KL80) – SSR, Operational. SSR livery. 4905 – Bogies used for the Interail 423 Class gauge conversion project. In use for static traction motor testing at Seymour (Vic) for Traction Engineering. 4906 – LVR, Operational. Patrick Red livery (minus logos). MM01 (4907) – Owned by Manildra Group. Shunter at Manildra Flour Mill. 4908 – Engenco, Operational. Coote Industrial livery, Broken Hill shunter (on lease to Qube). 4909 – Bogies used for the Interail 423 Class gauge conversion project. Scrapped at Casino in 2008. 4910 (KL81) – SSR, Operational. SSR livery. 4912 – Bogies used for the Interail 423 Class gauge conversion project. Scrapped at Casino in 2008. MM02 (4913) – Owned by Manildra Group. Shunter at Gunnedah Flour Mill. 4914 – Bogies used for the Interail 423 Class gauge conversion project. Scrapped at Casino in 2008. 4915 – Scrapped at Cardiff, 1989. 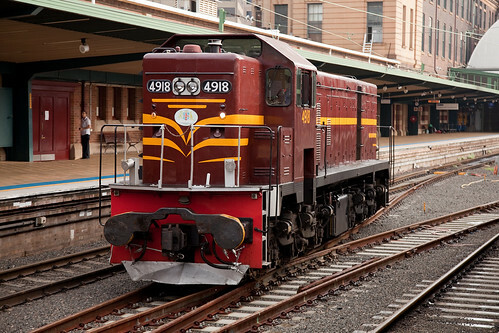 4916 – Preserved at the NSWRTM in the NSW SRA “Candy” colour scheme. 4917 (KL82) – SSR, Operational. SSR livery. 4918 – Owned and preserved by 3801ltd in the NSWGR “Indian Red” colour scheme. “49’ers” by Chris Walters, as published in Locomotion (Summer 2008) by the ARHS NSW. 4903 and 4906 now owned by LVR.